Showing results for tags 'want to buy or trade'. Looking for a Cab & doors to fit a 48 EE. Left out in rain with windows missing. Rest of truck is ok + engine & trans are reman. Got for minor trim parts on a 47 EE. Willing to sell as is or replace cab. I'm looking for a pass side exhaust bracket for a 74 f model mack. I'm also looking for an air ride mack cutoff. Looking for a complete set of mack e9 v8 injectors. They can be used or in any condition as they will be rebuilt anyway. Prefer the ambac injectors but bosch is fine too. tom.brown@ecotoh.net Thanks! Does anyone have a E9 oil pan they would sell? I have E9 and E7 parts for trade. Tell me what you need and I will check to see if I have them. WANT TO BUY OR TRADE 4:17 rears possible trade for 4:64's? I am trying to help clean out some buildings for a friend to raise money for hospital expenses of his father who was a life long trucker and mechanic and has quite a few parts for older trucks that are still in very good condition and usable including grill shells, hood sides, dashes, gages, seats, trim, cab lights, brake shoes, tools, engine parts, saddle fuel tanks, what is left of an old a model and eh model, and other misc. parts and pieces for b models and h models. looking for someone to come and buy all the Mack parts for a reasonable price. the parts are located in north central Pennsylvania, in eagles mere, pa 17731if you know of anyone interested please contact. I can forward pictures if anyone is interested. thank you. I'm looking for some r model parts. A cross member. I think anything back from the spread will work. Also a tan fuse box cover ,a Mack pyrometer, and a 1980's radio. I'd like to find a 10B Bucyrus in any condition, whole or parts. I've been wanting a small friction machine to play around with and I think a 10B would hit me just about right. Any leads would be much appreciated! 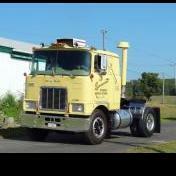 Have a very nice original 1974 IH Loadstar I'd trade if any interest is there. Thanks for looking! Does anyone have a t-2130 they would be willing to sell? I have a t-2090 I could trade. I already checked Manders diesel and they currently don't have anything. Aight folks here's the deal, I need an E9 block, 4 heads and a flywheel housing....that's it! Ok maybe 4 used head gaskets and a few bolts to hold it all together. I'm trying to get some tubular exhaust mocked up for us E9 guys but would rather do it on a "jig" than my truck. Basically I can use junk parts with big holes in em as long as the exhaust ports and flywheel housing are in the right place. WANT TO BUY OR TRADE AB headlights and dog shredding paper brass plaques. I bought a 1922 AB and it is missing both of the brass plaques with the bulldog shredding the paper that says operating costs. I also would like to replace the headlights because they are not complete. I don't know how they work since it doesn't have a generator or a battery, but I would like something that looks better. While I am at it I could also use the linkage for the hand throttle and spark arrester that attach to be shaft on the bottom of the steering shaft. I also would like to replace the water pump. Please let me know what you have. Thanks. Mike, Boyertown, Pa. I am in need of a set of 22 inch spokes for a fa600 front axle. I have a set of 24's I'm willing to trade as well. Well im looking for a tag axle, lift axle for mmy ride. Id prefer a steerable air up air down, 13k or better but will entertain anything with disc wheels, no spokes please. Looking for any rocker assemblys for an e9 v8 with no dynatards, has to be non dynatard. I dont necessarily have to have a complete set for a whole motor, just like a few for spares. Dont need the push rods either. tom.brown@ecotoh.net Thanks! Guys does anybody have 8"x24" rims need a few for my rig. I need a pair of V8 emblems for my B755. Looking to buy or maybe trade, I have a lot of B model and superliner parts.